An exceptionally-preserved fossil from Herefordshire in the UK has given new insights into the early evolution of sea cucumbers, the group that includes the sea pig and its relatives, according to a new article published today in the journal Proceedings of the Royal Society B.
Palaeontologists from the UK and USA created an accurate 3-D computer reconstruction of the 430 million-year-old fossil which allowed them to identify it as a species new to science. They named the animal Sollasina cthulhu due to its resemblance to monsters from the fictional Cthulhu universe created by author H.P. Lovecraft. 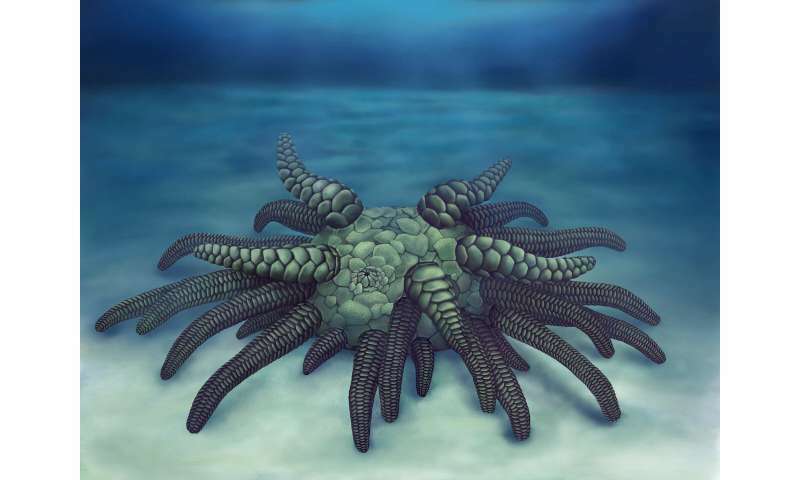 Although the fossil is just 3 cm wide, its many long tentacles would have made it appear quite monstrous to other small sea creatures alive at the time. It is thought that these tentacles, or 'tube feet', were used to capture food and crawl over the seafloor. Like other fossils from Herefordshire, Sollasina cthulhu was studied using a method that involved grinding it away, layer-by-layer, with a photograph taken at each stage. This produced hundreds of slice images, which were digitally reconstructed as a 'virtual fossil'. This 3-D reconstruction allowed palaeontologists to visualise an internal ring, which they interpreted as part of the water vascular system—the system of fluid-filled canals used for feeding and movement in living sea cucumbers and their relatives. 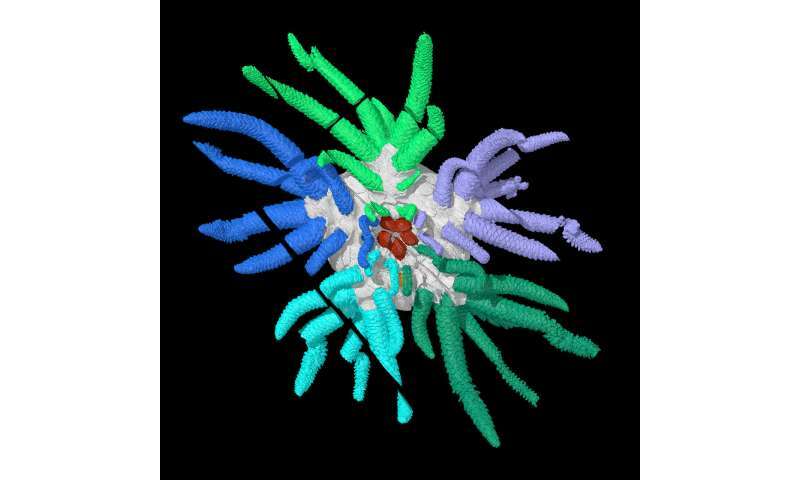 "Sollasina belongs to an extinct group called the ophiocistioids, and this new material provides the first information on the group's internal structures. This includes an inner ring-like form that has never been described in the group before. We interpret this as the first evidence of the soft parts of the water vascular system in ophiocistioids." The new fossil was incorporated into a computerized analysis of the evolutionary relationships of fossil sea cucumbers and sea urchins. The results showed that Sollasina and its relatives are most closely related to sea cucumbers, rather than sea urchins, shedding new light on the evolutionary history of the group. "We carried out a number of analyses to work out whether Sollasina was more closely related to sea cucumbers or sea urchins. To our surprise, the results suggest it was an ancient sea cucumber. This helps us understand the changes that occurred during the early evolution of the group, which ultimately gave rise to the slug-like forms we see today." The fossil was described by an international team of researchers from Oxford University Museum of Natural History, University of Southern California, Yale University, University of Leicester, and Imperial College London. It represents one of many important finds recovered from the Herefordshire fossil site in the UK, which is famous for preserving both the soft as well as the hard parts of fossils. The fossil slices and 3-D reconstruction are housed at Oxford University Museum of Natural History.